A Bologna Welcome Card is available for 48 hours (€20). The card gives you free access to the city’s museums and facilities, a tourist map with an itineraries and places of interest, free WiFi in the city, two tickets for the BLQ shuttle bus or one 24-hour pass for public transport. There are discounts and special offers for clubs, shops, restaurants, health clubs and leisure activities. 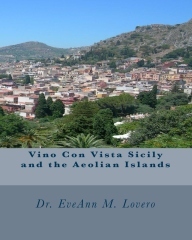 It is available at all tourist offices. Walk under the unique covered arcades, Portici, for a total of 38 km. The portici are currently nominated as a UNESCO World Heritage Site. 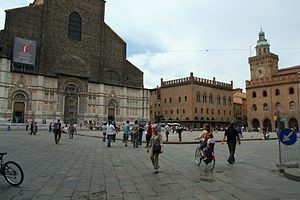 Check out Piazza Maggiore in the center of town. Palazzo D’Accursio/Palazzo Comunale, Piazza Maggiore 6, ☎ +39 051 203111. Tu-Su 10AM-6PM. A 14th-century palace. There is an enormous main staircase designed to be used by horse drawn carriages. 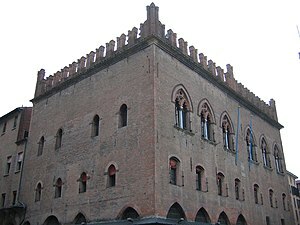 This is the home of the Municipal Art Collection and the Museo Morandi. 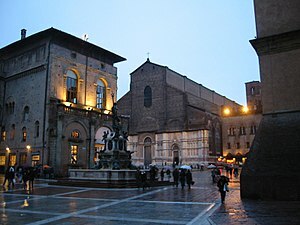 This large pedestrian square is surrounded by the Basilica of San Petronio, Palazzo d’Accursio, the portico dei Banchi and the Palazzo del Podestà. 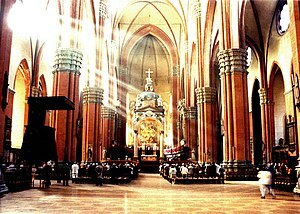 The Basilica of San Petronio, Piazza Maggiore, ☎ +39 051 231415. Daily 8AM-12:30PM & 3PM-6PM. 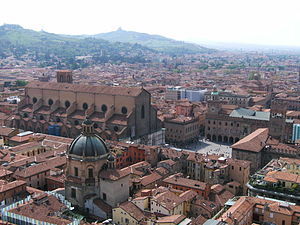 The “Duomo” of Bologna is the 15th largest church in the world by volume. The Basilica houses various treasures including: the sundial by Cassini and Guglielmini, which indicates the exact period of the current year at all times; the “San Rocco” by Parmigianino and the marvelous Bolognini Chapel. 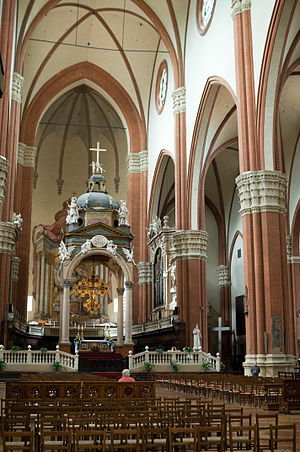 There is also a museum to the left nave of the basilica where bas-reliefs are on display. Next to Piazza Maggiore is Piazza del Nettuno, which contains the Fontana di Nettuno, a fountain built in 1563 by Tommaso Laureti of Palermo and later embellished by Jean de Boulogne (Giambologna). 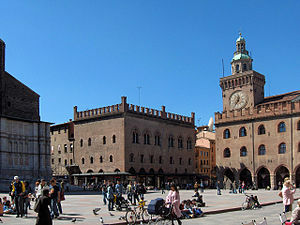 It is considered to be one of Bologna’s symbols. Got to Via Rizzoli. This is one of the main streets of Bologna. 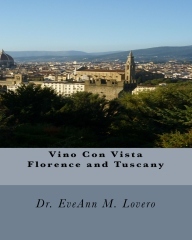 It opens up to Piazza di Porta Ravegnana, where the two famous towers rise. 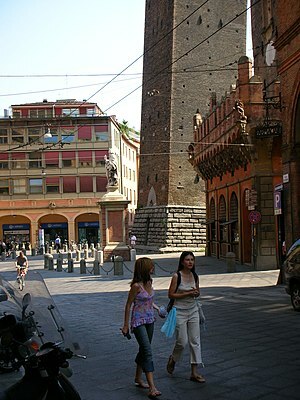 Torre degli Asinelli and Torre dei Garisenda (The Two Towers), Piazza di Porta Ravegnana. 9AM-6PM. 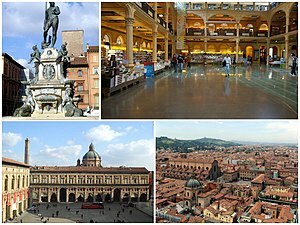 The main symbols of Bologna, built in the 12th century. Torre degli Asinelli is 97.20 metres tall (330 feet), with 498 steps and an incline of 1.3 meters (4 feet). Torre dei Garisenda (closed to the public) is 47 metres (162 feet) tall and has a lean of over 3 metres (10 feet). €3 to climb Torre degli Asinelli. 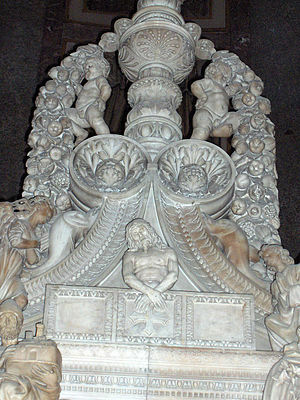 Check out Corte de’ Galluzzi through a vault from Piazza Galvani, in front of the Archiginnasio. 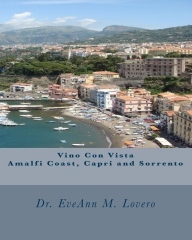 Go to the University Quarter on Via Zamboni where you will find plenty of bars and cafés. 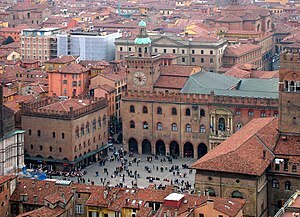 The University of Bologna is the oldest university in the world. It was founded in 1088. Tour the Orto Botanico (Botanical Gardens), Via Irnerio 42. M-F 8:30AM-3:30PM, Sa 8:30AM-1PM. 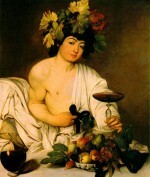 Created in the mid-16th century for medicinal herbs. The Botanical Gardens are home to over 5,000 plant species. Admission is Free. Go to Certosa di Bologna on Via della Certosa 18. Daily 7AM-6PM. This is Bologna’s main cemetery with beautifully carved tombstones, built over the ruins of an ancient Etrusan necropolis. Bologna was a city of canals much like Venice. Today most of the canals are underground but in Via Piella you can still see “il canale delle Moline” through a small charming window or “finestrella”. 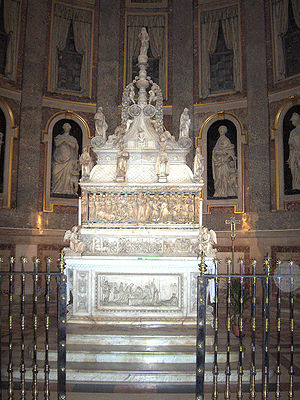 Tombe dei Glossatori, Piazza San Domenico e Piazza Malpighi. Named for the lawyers who used to add glosses (notes) to documents. The tombs, which date from the end of the 13th century, are monumental arches covered with shrines, supported by columns decorated with enamelled tiles, within which are the remains of many of Bologna’s famous scholars. 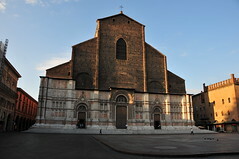 Basilica di Santo Stefano, Piazza Santo Stefano. “Sette Chiese” The so called Seven Churches, a complex of connected chapels with the 2 earliest religious edifices in Bologna, the Holy Sepulchre from the 5th century and the Holy Crucifix from the 8th century. One of the most famous sights of the city. Santuario della Madonna di San Luca (San Luca’s Basilica), Colle della Guardia. 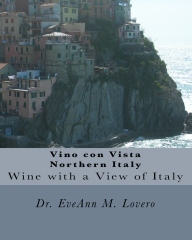 Completed in 1765 there is a fabulous “Vino con Vista: panoramic view of the City. Walk along the 666 arches of its unique portico. This is where you will find the “Madonna di San Luca”. Basilica of San Domenico, Piazza San Dominico 13, ☎ +39 051 6400411. Houses the remains of Saint Dominic, founder of the Order of Preachers (Dominicans) inside the shrine Arca di San Domenico, made by Nicola Pisano and his workshop, Arnolfo di Cambio and with later additions by Niccolò dell’Arca and the young Michelangelo. The church’s small museum houses many important works of art and a wide collection of precious reliquaries and chalices. 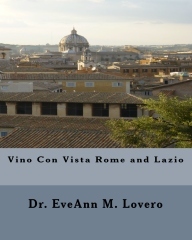 Santa Maria della Vita, Via Clavature 8-10, ☎ +39 051 236245. Museum & Oratory: Tu-Su 10AM-12PM & 3PM-7PM; Sanctuary: M-Saturday 7:30AM-7PM Sunday & holidays 4:30PM-7:30PM. The cupola was designed by Bibiena and is the most important example of Baroque architecture in Bologna. 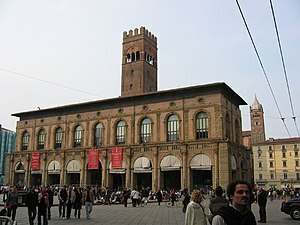 Includes the Sanctuary which houses the largest collection of terracotta sculptures of the Italian Renaissance, the masterpiece Compianto sul Cristo Morto “The Lamentation” by Niccolò dell’Arca; the Oratorio dei Battuti, which houses the Transito della Vergine by Alfonso Lombardi, and the Museum of Health, situated in the old Santa Maria Della Vita hospital.